Preventive maintenance is the key to keeping any hardwood floor in tip top condition. By following the precautions mentioned below your new hardwood floors should endure years of enjoyment. Large amounts of water is an enemy to any hardwood floor investment. While we realize you cannot keep on top of it like a spy covers his target, any type of water spills large or small should be cleaned up as quickly as possible. Area rugs should be placed near entry areas and sources of moisture such as any sink, refrigerator, and even the dishwasher. Door mats at outdoor entries should be utilized as well. We've found a medium pile bristle type mat is most effective in collecting grit that would have found its way on to your floors. 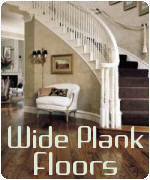 Grit, and small sand particles can play havoc on any hardwood floor. They act almost like sandpaper if they are not cleaned up on a regular basis. Vacuum cleaners with soft brush attachments can be used, or simply a soft bristle type push broom. We strongly advise when moving any furniture to pick up and carry to the new location. Or as an alternative if you don't have any handy helpers around, cut small swatch squares from older carpet, placing the fuzzy side down under the furniture legs and pushing. This procedure works like a charm only if the carpet is clean and free of grit. 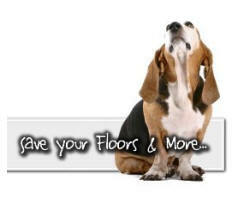 Larger, heavier pets can damage hardwood floors quickly. Their favorite sport seems to be running to the door when the doorbell rings. Using rugs in this area will stop the scratching when Fido finds he can't stop and keeps banging into the front door. Larger pets should also have nails trimmed on a regular basis. Other options include doggie boots, where a coating is applied to the pets nails every month or so reducing potential scratching. Any Bonita Springs veterinarian offers these services for your favorite critters. 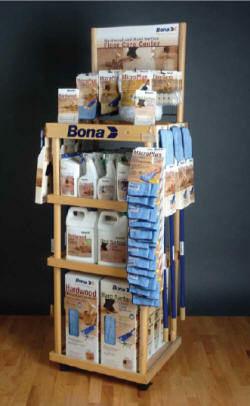 Features Bona® Swedish Formula® cleaners and MicroPlus micro fiber, a revolutionary breakthrough in textile technology. The MicroPlus fibers' unique structure attracts and absorbs dirt, dust, household allergens, and micro particles.